Research shows that young children who engage in an early education curriculum will most likely be ready to participate in ongoing learning and thrive at school. In our Pre-Kindy Kangaroo room, we provide a wide range of learning experiences which encourage learning through play for pre-kindy children aged from 3 to 4 years old. The day is divided between indoor and outdoor play where the children fulfill their curiosity as they explore and discover the world around them. The health and well being of every child at Oz Education is just as important as their learning experiences. Professional audiologists, speech pathologists and dentists offer regular, on-site health assessments and talks which will help your child achieve optimum health and develop good habits that will carry them into their later years. Every child is encouraged to participate in our community program which helps them to develop a strong sense of identity, belonging and respect amongst their local community. The program includes cultural celebrations which provide a rich and diverse experience for children and their families. We also offer weekly sport, dance and fitness classes which enable every pre-kindy child to learn amazing skills and blossom into confident, well-rounded individuals. At Oz Education, you will have the peace of mind that everything your child needs is provided each day. We provide all meals, nappies, wipes, linen, sunscreen in a safe environment with first-class facilities and award-winning resources. Your child’s daily routine will be filled with lots of time for fun and exploration throughout their entire journey with us. 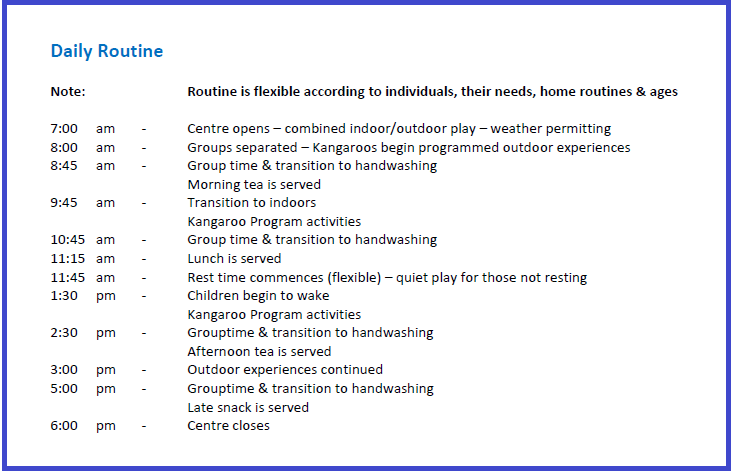 Below is a sample of the daily routine in our Kangaroo Room which changes to suit the growth and developmental needs of each child. Call us on 1300 088 520 or visit our centres located in: Alexandria, Auburn, Campsie, Homebush, Lidcombe, Miranda, Putney and Tuggerah.